Mitt Romney’s praise of “self-deportation” alienated two fast-growing ethnic groups. Two-thirds of Hispanics and an even higher portion of Asians supported Obama. The anti-immigrant stance doesn’t just squander votes. It costs Republicans money and threatens U.S. growth. 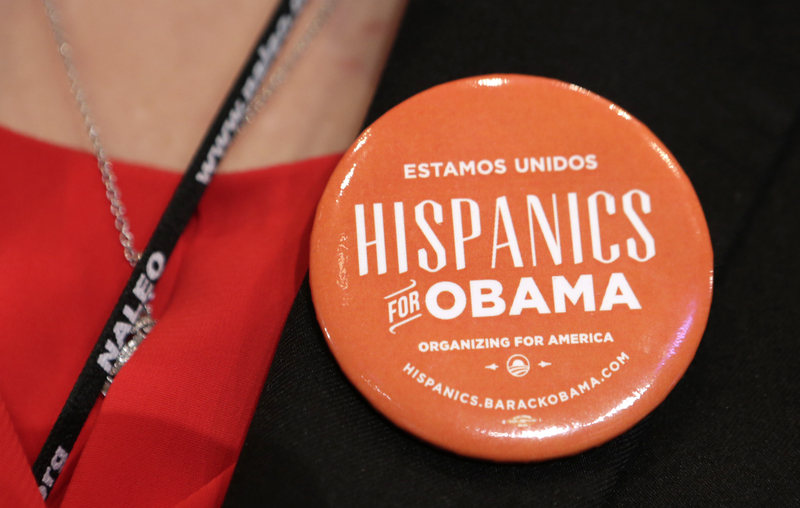 A woman wears a pin which says "Hispanics for Obama" before U.S. President Barack Obama spoke at the National Association of Latino Elected and Appointed Officials (NALEO) annual conference in Lake Buena Vista, Florida June 22, 2012. President Barack Obama has won re-election. Support for Obama was particularly strong among the estimated 24 million registered Hispanic voters. About two-thirds voted for the president, according to Reuters/Ipsos election day polling. Hispanics accounted for more than half of U.S. population growth between 2000 and 2010, according to the most recent census. Asians have recently surpassed Hispanics and become the largest source of new immigrants, according to a study by the Pew Research Group. Exit poll data showed more than 70 percent of Asian-Americans voted for Obama.